Syria’s government widened its media blackout Thursday by blocking access to the live streaming site Bambuser.com. The step apparently was meant to suppress citizen reporting from Homs, a city that has been shelled by the Syrian army for days. 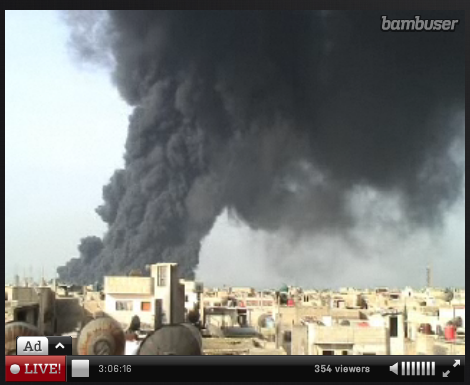 Citizens in Homs have been reporting on the attacks through live streaming for days. Their footage has been picked up by numerous major media organizations, including the BBC and CNN, which are barred from reporting in the country. A Bambuser spokesperson estimated that about 90 percent of the footage coming out of Syria on recent days was originally broadcasted via Bambuser. This isn’t the first time of live streaming and video hosting sites being blocked during the Arab Spring. Egypt and Lybia cracked down on Internet use during the uprisings in both countries, and Lybians resorted to sneakernet methods to smuggle footage out of their countries, uploading clips from Internet cafes in Egypt to circumvent their government’s censorship.